Country Rose Soap Co. has been making quality, handmade natural bath and skin care products for health conscious consumers for over 17 years. Committed to specialized, small bach recipes, we use the highest quality natural and / or organic ingredients in all of our natural body care products, including premium and / or organic vegetable oils and fats, cosmetic clays, specialty ingredients, natural mineral colourants, as well as therapeutic and / or organic grade pure essential oils just to name a few. Effective, highly concentrated, moisturizing, soothing, and gentle, our natural skin care products appeal to health conscious consumers and to anyone with a desire to know AND understand the ingredients being applied to one's body in one's daily cleansing and beautifying regiments. 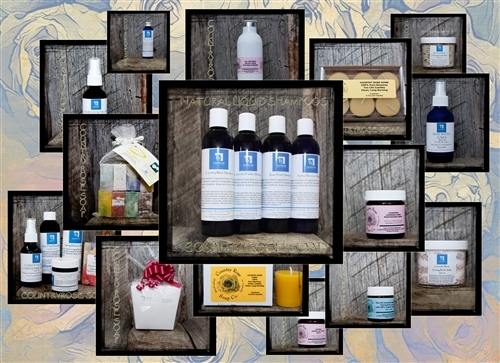 With an ever increasing number of natural and / or natural organic options, Country Rose Soap Co. is proud to offer an extensive line of of natural herbal salves, natural lip balms, natural skin creams and lotions, as ell as pure emu oil products, and natural bath and hair care products.